When it comes to forklift training, many companies are faced with OSHA compliance issues – but they don’t have the internal resources or manpower to handle this important task. OSHA requires that every employer should provide forklift training and certification for their employees. But that doesn’t mean they have to hire more people to do the job! CertifyMe.net, the leader in online forklift certification, offers an easy, affordable solution: staffing agency forklift training. Unlike other 3rd party training providers, we work with your company to get every forklift driver certified – right on our website! Whether you need to train temporary employees or full-time workers, we’ll handle all of your forklift training requirements. With our easy 5-step process, we handle all your staffing agency forklift training needs, so you can concentrate on other pressing jobs. CertifyMe.net has an entire selection of user-friendly, affordable forklift training packages for all types of forklifts. Best of all, with our staffing agency forklift training solutions, you’ll enjoy OSHA compliance quickly and affordably! Staffing agency forklift training! This could be the biggest NO-BRAINER in the history of Staffing! You don’t need to take valuable Sales People out of the field to train forklift operators. You don’t need to hire additional personnel to handle the logistics of training and certification. We do it all for you! We have been training and certifying forklift operators since 1999. Multiple locations, monthly billing, accounting for trained students, providing necessary documentation. We handle it ALL. Forklift operators have to be trained and evaluated on the lift truck they will be operating at the workplace – no matter what. Hands on evaluation must be completed by the employer designated evaluator regardless of who performs the classroom training. Don’t get left behind. This opens doors and is the most cost effective means available! Contact Us or call toll free 8-5 AZ time 888.699.4800 to speak to our large account specialist. OSHA has issued several letters of interpretations on the subject of training of temporary employees. Basically, there is a shared responsibility for assuring employees are adequately trained. The responsibility for providing training should be spelled out in the contractual agreement between the two parties. The temporary agency or the contracting employer may conduct the training and evaluation of operators from a temporary agency as required by the standard; however, the host employer (or other employer who enters into a contract with the temporary agency) must provide site-specific information and training on the use of the particular types of trucks and workplace-related topics that are present in the workplace. Staffing Agency Alert: Misunderstood regulation means huge opportunity for staffing industry. OSHA has spelled out its regulations concerning temporary employees in a series of letters of interpretation. The forklift temp agency and the contracted employer (that is, you) have shared responsibility for the training and certification of forklift operators. According to the OSHA standard, either the contracted employer or agency may conduct the staffing agency forklift training, evaluation and certification of forklift operators employed by the forklift temp agency. It is the responsibility of the host employer to deliver training and information about the workplace and on equipment that is used on the premises. Forklift training must consist of both formal written instruction and practical training, followed by an evaluation. OSHA law states that, regardless of which party provides the forklift certification classroom training (Step One of the CertifyMe.net two-step forklift training and certification program), it is the designated evaluator of the host employer (again, you!) who must conduct the practical training and evaluation (Step Two). According to OSHA, forklift training must also consist of two main topics: truck-related topics and workplace-related topics, which apply to all operators. Temporary and permanent employees need OSHA-compliant forklift training to operate forklifts safely and avoid accidents that can cause serious injuries and fatalities. CertifyMe.net has created the most comprehensive OSHA-compliant forklift training program available. Besides including all required content and components, it’s also completely online and takes only about one hour to complete from any device with an internet connection. It’s the convenience and ease of our program that makes it the only staffing agency forklift training available. It’s basically made for temporary or contract employees! 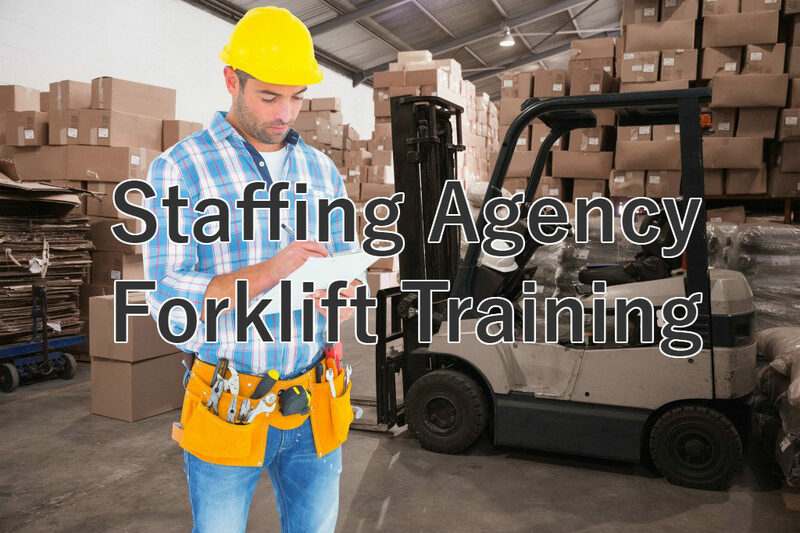 Need Staffing Agency Forklift Training? Contact CertifyMe.net Today! CertifyMe.net has compiled a standard Designation Evaluation Letter for you to complete and print out on company letterhead. We recommend you keep a copy in either your safety file or in the employee’s file. This is available right now, at no charge, on the CertifyMe.net website. But that’s not the only thing we thoughtfully take care of for you! We provide the time-consuming classroom training and all of the documentation necessary to complete the forklift certification process for all of your forklift operators, whether they are employed directly by your company or by a forklift temp agency. This means that you do not need to hire extra training staff or take your sales people out of the field to conduct the hands-on training. What better way to meet the OSHA obligations for providing equipment-specific staffing agency forklift training for your operators who are employed by a forklift temp agency, than to use CertifyMe.net? At a cost of $59.95 per operator for the CertifyMe.net forklift training program, this is an efficient and cost-effective way to make sure you don’t fall foul of OSHA regulations and land yourself with a hefty fine. Get Started Today with our Forklift Staffing Agency and Full-Time Employee Training! Here’s the bottom line with OSHA forklift certification: if a worker (full-time or from a staffing agency) drives a forklift at your site, they need trained. CertifyMe.net helps both full-time employees and staffing agency workers with forklift training. We’ve helped dozens of companies throughout the United States with this unique situation – and we can assist you, too! To find out more about how we can help you with forklift certification and your forklift staffing agency needs, contact us on 1-888-699-4800, or fill out our handy contact form. You or your staffing agency forklift employees can have OSHA-compliant forklift certification in one afternoon!